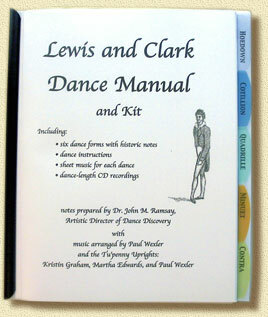 Our Lewis and Clark Dance Manual and Kit makes learning the dances of the period easy! The dance instructions are on separate pages and can be removed for copying. Each of the five genres are divided by tabbed dividers into Hoedown, Cotillion, Quadrille, Minuet, and Contra. The music scores are alphabetized in a back pocket, beautifully printed, and put on heavy card stock. 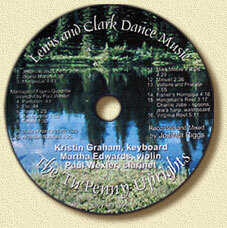 The CD, also in a pocket, is supplied with a sheet of specifications as to tempo, bar, phrase, and repetitions. The Kit has been designed to make the dances which would likely have been danced in St Louis in 1804 accessible to teachers, groups, musicians, and others interested in the cultural background of Lewis, Clark and the men of the Corps of Discovery. Order today using this handy mail-in Order Form. We have done the work of researching, testing, describing, recording, and assembling. We have not included native American dances—our expertise is rooted in Country Dance—but we have included dance styles ranging from the riverfront to the ballroom. Everything you need to teach these dances to your group is provided so that you can step into the past. Lewis and Clark Dance Manual and Kit is available postpaid by sending a check for $55 to John Ramsay, 520 Mapleview Drive, St Louis MO 63130. Use this handy mail-in Information and Order Form.